If you have read any of my previous articles, it’s no secret that I live in the Midwest. I have been writing from the perspective of someone in the 15th largest city in my country. However, the view is quite different in the top 10. New York City, Washington D.C., Chicago, Seattle, and the big cities in California (LA, San Francisco, etc.) 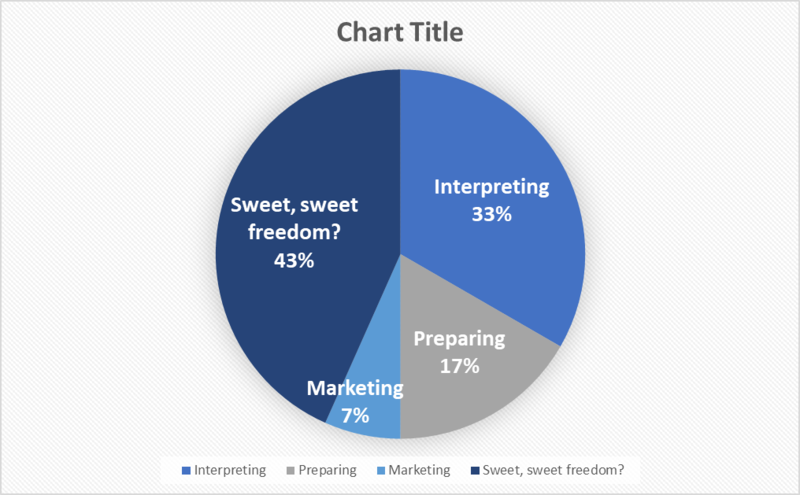 are much bigger and more diverse markets for interpreters. So, this article will focus on what life is like for them! Shout out to all the styling, swanky metropolitan interpreters who were kind enough to contribute to this article. From the perspective of a former in-houser who interpreted for several hours each day, what I learned about the work load of big-city freelance interpreters was shocking. On average, true conference interpreters (CIs for short) in metropolitan areas are only working 8–12 days a month. Most reported that they spend another 5 days preparing for assignments and 2 days marketing and accounting. That means, out of a 30-day month, on average only 33% of their time is spent on the job. As with any other city, the workload seems to vary between feast and famine. For most cities in the US, fall is the busiest time of the year, followed by Spring. While some CIs supplement with translation in the off-seasons, more than half of the CIs I interviewed said they never take on any work outside of interpreting. The type of assignments you get in a metro area will vary by region. 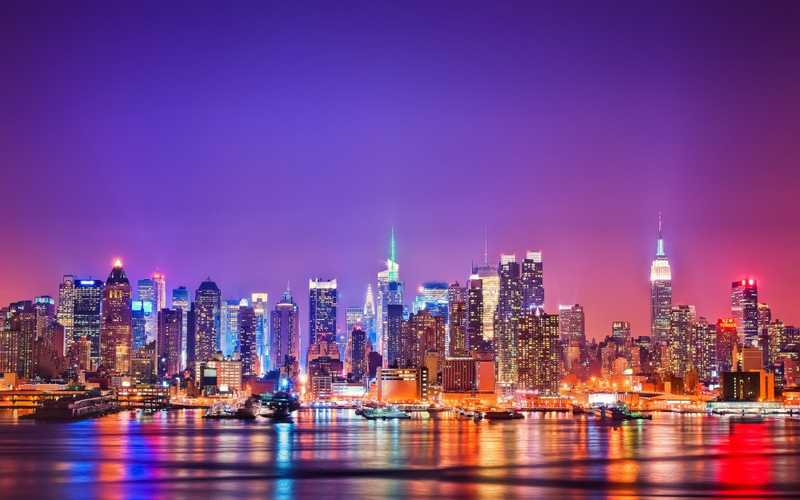 New York will see a lot of private business and finance related jobs. Washington D.C. has much more diplomacy and institutional work. The west coast, and California in particular, has a lot of seminars, public talks, and private business negotiations mainly for the tech sector. With the large Japanese populations concentrated in these cities, there is also a demand for community interpreting. However, of the CIs whom I interviewed 75% said they never or only rarely do community interpreting. When it comes to type of assignments, the overwhelming majority (50-80%) of the work comes from private business events. These are events such as negotiations with a vendor or client in Japan, high-level knowledge transfers between branches of the same company, Investor Relations type meetings, or internal board meetings with multiple languages represented. The attendees are usually from one or two companies at most and the content (agenda, slides, background information) is not publicly available. 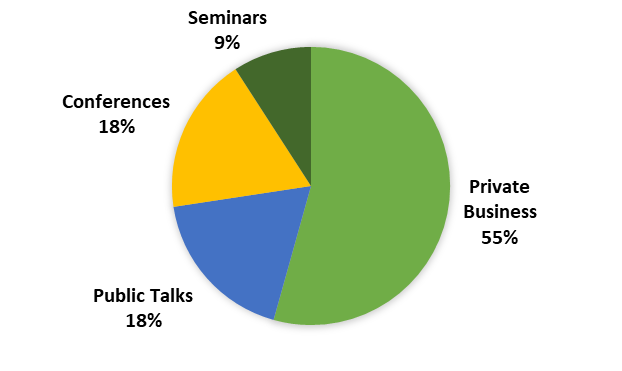 The second largest category is a tie between public talks and conferences. A public talk would be an event at which a Japanese guest is invited to speak because of their fame or expertise on a given subject. Think of a famous director being interviewed at an anime convention or a doctor who made a ground-breaking discovery for cancer treatment giving a talk at a medical school. The event is tailored for interested parties to hear a specific person speak. A conference, on the other hand, is a large event with many speakers. The Japanese delegate may be one of those presenting, or the conference might be entirely in English with the Japanese delegates attending just to listen. The nice thing about conferences is that they are public events. The speakers and content are usually explained in detail on the conference website. Even if you cannot get information from the organizers or your agent, you still have something very valuable to help you prepare. The last category is seminars. These are generally smaller events with only one or two speakers focusing in depth on a specific topic. Like conferences, seminars often have publicly available information and so are easier to prepare for. Another difference between big cities and small towns is the direct client vs. agency work ratio. Half of those interviewed say that the majority of their work comes from agencies. Another 25% say they get equal portions of direct clients and agency work. The remainder said their work is almost entirely direct clients. This differs greatly from small cities in the US where most of the work is for direct clients and cities in Japan where almost all the work is from agencies. You really have to be ready to market yourself to companies and network with other interpreters if you want to succeed in the US. Indulge me in a bit of a digression from geographical locations to the great metropolitan hub which is the internet. RSI stands for “Remote Simultaneous Interpreting.” If you don’t know what RSI is, check out my previous article on the subject. Essentially, it is a platform that allows CIs to provide simultaneous interpreting over the internet as though their home office were their booth. Many in the interpreting industry feel that RSI is the future of our profession and CIs will have to adapt to it or lose their livelihood. So, I wanted to check in with our big city CIs to see if the new technology is disrupting their business as much as it is hyped to. In reality, no, it is not. Only one of the CIs I know does RSI on a regular basis. The rest do it rarely or never. In fact, given the choice between the following options, many chose the negative outlook on RSI. The day may come when RSI is mainstream in our industry. However, I would posit that we are not going to see the landslide of adoption which the tech companies who promote this technology are predicting. Many of our clients simply prefer to have a person in the room. Many of our clients also do not trust the internet. Some still send preparation material by mail! So, there is and will always be a demand for in-person. Is a city the right place for you? Whether you are US-based and thinking of moving to a big city or Japan-based and thinking of moving to the US, there are a few things you should consider before making the jump to one of our metro areas. Here is are some cautionary points our CI colleagues brought up. Several big city CIs mentioned that there are already plenty of Japanese interpreters in their area. Therefore, there is a lot of competition. On the other hand, there are not many cases where supply outweighs demand so there is still some room for newcomers. Also, the level of situation varies by city so always reach out to a few interpreters in the area if you are considering branching into unfamiliar territory. When it comes to market saturation, keep in mind that there may be room in the community field, but not as much in the conference. This kind of work can sustain you for a while as you try to build a conference portfolio. Just remember not to undercut your colleagues by offering to do conference work at community rates. That is a quick way to make enemies of your potential boothmates. If you have spent your whole career in Japan, conditions in the US may be kind of a shock. Overall, things are much worse for interpreters here than they are in Europe or Japan. We have to fight for basic things that CIs in other countries consider basic. In a previous article, I mentioned clients pushing back against having two interpreters for simultaneous. Three interpreters for long or extremely technical assignments is almost unheard of. I also mentioned that booths are not common in most meetings. In addition, clients will often refuse to negotiate additional pay for streaming or recording. Some of our metro interpreters wanted to point out that networking and connections are much more important in the cities. It takes time to establish yourself with the senior interpreters, direct clients, and agencies. So, it is not as straightforward as “move to a city and get jobs.” Despite that, some of the best rates in the country can be gotten in New York and the San Francisco bay. Which means that it is worth it to take the time and build these connections to establish yourself in the city.